Fish species that are both economically and ecologically important in South America live mysterious lives. Scientists know relatively little about the thousands of fish species living in the world's largest river system - from the primitive, boney-tongued Arapaima that is the largest fish in the Amazon to giant catfishes that undertake some of the longest migrations of any freshwater fishes in the world. "These species have the potential to disappear if we don't learn more about them. We know next to nothing about many of them even though many are being harvested at alarming rates," said Ted Hermann, a doctoral student in fisheries science at the SUNY College of Environmental Science and Forestry (ESF) in Syracuse, New York. "This is a unique ecosystem and some of these fishes are enormous animals. And they might be gone in a matter of decades." 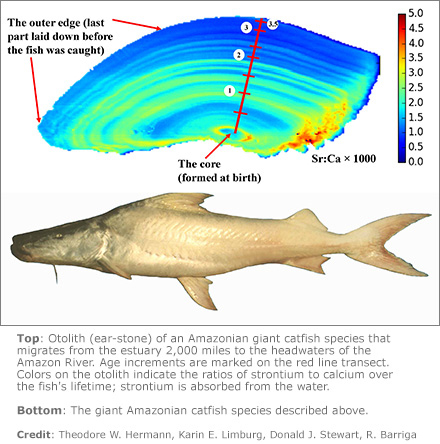 To that end, Hermann and three co-authors published a study today (June 8, 2016) in the new online journal, Royal Society Open Science, that reports on the use of chemical analysis of ear-stones or "otoliths" as a way to tease out a fish's life story, potentially revealing its migratory routes and the environments it encountered in its travels. The paper, titled "Unravelling the life history of Amazonian fishes through otolith microchemistry," describes the identification of chemical markers that can trace a fish back to the Amazon estuary and to "black water" vs. "white water" rivers. Another marker reveals that at least one species, the Amazonian corvina, may not be as sedentary as previously believed, raising new questions about how best to ensure the long-term survival of this economically important fish. The study is part of an emerging body of knowledge that lays critical groundwork for the conservation and management of these threatened species. The goal is to provide fisheries managers and conservationists with better information about how to protect fishes from threats that include deforestation, mining, oil drilling, construction of dams for hydroelectric power, and overfishing. The study is part of Hermann's doctoral dissertation. His co-authors are Donald J. Stewart, who is Hermann's adviser, and Karin Limburg, both fisheries ecologists at ESF; and Leandro Castello, who completed his doctoral work at ESF and is now a faculty member at Virginia Tech. The research focused on the migrations of Amazonian fish species, some of which travel as much as 3,200 km (nearly 2,000 miles) in the Amazon River and cross international boundaries during the course of their lives. "When commercial fishes migrate among several countries, their conservation and management demand international agreements, and those in turn require knowledge of the fishes' basic biology," Stewart said. Dams also present a challenge. "As more and more hydroelectric dams are being built in the Amazon Basin, this sort of new information can allow us to identify sites where dams would have minimum impact on these fishes and associated fish yields," said Castello. Of particular interest to researchers are the stories told by otoliths - ear-stones that contribute to a fish's ability to hear and balance. Made of calcium carbonate, otoliths grow as the fish grows, forming rings each year that can be read much the same way as a tree's rings. Their growth incorporates traces of other elements that reflect the inherent chemistry of the water in which the fish lived. Through X-ray fluorescence and mass spectrometry analysis, scientists can extract from the otoliths the story of the fish's growth and movements among different environments. Using analyses of otolith chemistry as a research method presents distinct advantages over other tracking methods, Hermann said. The vastness of the Amazon system, which drains nearly 7 million square kilometers (approximately 4.3 million square miles) means most locations are remote enough to make tagging impractical and expensive for many species. Some species move extensively throughout their lives, making direct tracking difficult. Tagging and tracking devices typically cannot be used on larvae or small juveniles, leaving a fish's early life unknown; also, costly satellite tags can be lost if a fish is caught by a fisherman. The best management decisions require knowledge of a fish's life history from hatching through its larval, juvenile and adult stages in addition to its spawning behavior. For example, otoliths tell the story of whether a fish lived in "black water" (more acidic rivers that resemble tea and have an abundance of decaying plant material) or "white water" (rivers, heavy with sediments, that look like coffee with milk). The Amazon estuary also has its own chemical markers related to the mix of fresh and salt water that indicate a fish spent some of its life in that sprawling, unique ecosystem. "Fish constitute our last wild food source," Hermann said. "Everything else we have comes from farms. But that cod fillet from the grocery store was a wild animal. We're trying to study their biology as fast as we can - either before their environment is destroyed or before we eat them all up."